August 2017 | TOMMY JOHNSON, Jr.
BROWNSBURG, Ind. (Aug. 29, 2017) – Tommy Johnson Jr. and Terry and Doug Chandler’s Make-A-Wish Dodge Charger R/T Funny Car has a head of steam heading to this weekend’s 63rd annual NHRA U.S. Nationals, the most prestigious event of the Mello Yello Drag Racing Series season. No Funny Car has been more consistent than Johnson over the past five events when his team led by crew chief John Collins and assistant Rip Reynolds have advanced to four championship rounds and moved up one spot to fourth in the standings heading to Friday night’s qualifying session to begin the finale of the 18-race regular season. The only missing during that hot streak was winning a second Mello Yello title of the year. “We’ve done a really good job the last several weeks to put ourselves in a much better position heading into the Countdown to the Championship,” the veteran driver who advanced to the final round of the U.S. Nationals in 2002 said of the pending six-race Countdown playoff when the top-10 drivers after Indy will vie for the world championships. The U.S. Nationals offers a unique points system in the regular season where a driver can earn up to 191 points compared to the customary 130; each round win during Monday’s championship eliminations will be worth 30 points instead of the normal 20. Johnson is ranked fourth in points, trailing Don Schumacher Racing teammates Ron Capps (in first) and Matt Hagan (third) and ahead of another teammate, Jack Beckman (fifth). While he cannot overtake Capps, he can move up to second but also could be passed by Beckman. Points for the Countdown, which begins two weeks after Indy near Charlotte, are reset with the regular season points leader starting with a 20-point lead over No. 2. and others in the top-10 separated by t apart by 10-point intervals. Johnson, who estimates he’s competed in nearly 30 U.S. Nationals with his first in 1984, understands the importance of a high regular season finish. Last year he started the Countdown ranked seventh and finished second in the championship standings after advancing to four final rounds in the Countdown and winning twice. DSR’s seven nitro drivers and team owner Don Schumacher will be on hand to sign autographs at noon after a performance by the Gordon Pipers bagpipe and drum corp. In addition to a silent auction (see early items at dsr17.auction-bid.org), the Open House features one of Indiana’s biggest indoor car and bike shows organized by the Indy Hi-Winders Car Club, nitro Cacklefest, various displays and vendors and some of the area’s most popular food trucks and Papa John’s pizza. COUNTDOWN TO THE COUNTDOWN: Many drivers consider the U.S. Nationals to be the “first” race of the Mello Yello Series Countdown to the Championship six-race playoff that begins two weeks after Indy near Charlotte. The top seed for Saturday’s Top Fuel Shootout is DSR’s three-time and reigning world champion ANTRON BROWN, who will race the lottery winner in the first round. Other first-round matchups are: LEAH PRITCHETT vs. Doug Kalitta, TONY SCHUMACHER vs. Brittany Force and Steve Torrence vs. Clay Millican. The top-seed for Sunday’s Funny Car Shootout is DSR’s reigning world champion RON CAPPS, who will race the lottery winner in the first round. Other first-round matchups are: MATT HAGAN vs. John Force, TOMMY JOHNSON JR. vs. JACK BECKMAN and Robert Hight vs. J.R. Todd. BRAINERD, Minn. (Aug. 20, 2017) – Tommy Johnson Jr. advanced to his fourth final round in the past five events but came up a little short Sunday at Brainerd International Speedway but finished as the runner-up. 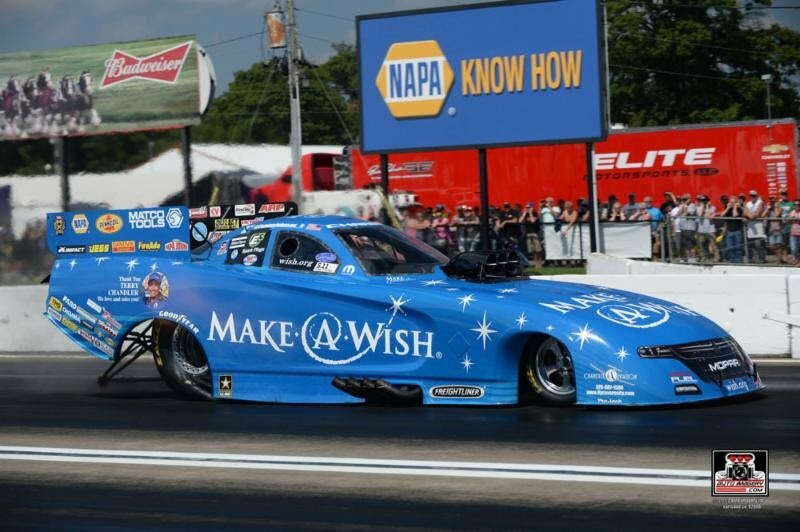 “It’s another runner-up, which is frustrating, but at the same time it’s a really good thing,” said Johnson, who moved up one spot to fourth in the championship standings with Terry and Doug Chandler’s Make-A-Wish Dodge Charger R/T Powered by Pennzoil. “We made a move in the points today, got ourselves in the top four and one of these days if we continue to run like that that runner-up’s going to become a win. Johnson with his crew chief John Collins and assistant Rip Reynolds entered race day as the No. 5 Funny Car with their time of 3.880 seconds at 330.96 mph in their quest for a second title of the year. Johnson defeated Jonnie Lindberg in the opening round and Courtney Force in the second. In the semifinals, he faced Robert Hight of John Force Racing who set the NHRA world time record on Friday night at 3.793 seconds (338.00 mph). Johnson caught a break when Hight made mistake at the starting line and thought he saw Johnson’s win light come on at the end of the track so Hight didn’t get back on the throttle. But Johnson’s lost traction and peddled the throttle a few times and was able to get the win with a subpar time of 6.875 at 128.60. In the final round, Johnson lost a close race to Alexis DeJoria whose time of 3.906 edged Johnson’s 3.933. In two weeks, the NHRA teams will battle it out at the prestigious U.S. Nationals, near Indianapolis. Then points are reset for the NHRA’s Countdown to the Championship playoffs. In 2015, Johnson finished No. 3 and went on to No. 2 in 2016. BROWNSBURG, Ind. (Aug. 16, 2017) – As the NHRA Mello Yello Drag Racing series heads to Brainerd International Raceway for the NHRA Nationals, Tommy Johnson Jr. believes that Terry and Doug Chandler’s Make-A-Wish Funny Car team is building momentum at a key time. The six-race Countdown to the Championship playoff begins after the prestigious U.S. Nationals over Labor Day Weekend near Indianapolis when the points standings are reset for the 10 drivers who qualify to contend for the world title. In 2015, the Make-A-Wish Dodge tuned by crew chief John Collins and assistant Rip Reynolds finished No. 3 in the points standings then went on to finish No. 2 in 2016. 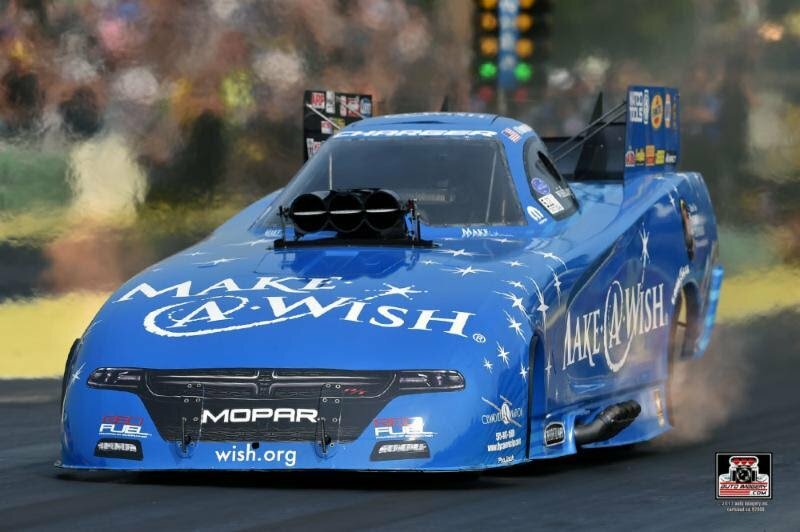 Johnson believes the consistency of the Make-A-Wish Dodge Charger R/T Funny Car will be important heading into the Countdown. Johnson has raced his way into three of the last four final rounds on tour but continues to seek his second win of the season. His first title of 2017 came in March at Las Vegas. Brainerd International Raceway has a history of producing big times for the nitro categories. Johnson believes this weekend will continue that tradition. BROWNSBURG, Ind. (Aug.14, 2017) – Don Schumacher Racing, the biggest and most successful team in professional drag racing, will host its most special day of the year on Sept. 1 (Friday) when it opens its doors to the public to support Riley Hospital for Children with its 12th annual Open House from 10 a.m. to 3 p.m. as the nitro kickoff for the NHRA U.S. Nationals at nearby Lucas Oil Raceway over Labor Day Weekend. The DSR Open House presented by Pennzoil attracted more than 4,000 fans last year to DSR’s 145,000-square-foot facility and raised a record $65,000 that pushed DSR’s total contributions to over $500,000 for the Riley Hospital for Children. A new feature this year will be a performance by the Gordon Pipers bagpipe and drum marching band that features Scottish/Celtic culture and music. The Gordon Pipers have been one of the most popular elements of Indy 500 pre-race festivities and perform at Indianapolis Colts games and other major Indy events. Riley Children’s Foundation is the fundraising arm of Riley Hospital for Children at Indiana University Health and the founding organization that opened Riley Hospital in 1924. Today Riley Hospital is recognized as one of the best children’s hospitals in the nation and is the only comprehensive children’s research hospital in Indiana. Our mission is to raise funds statewide to support Riley Hospital funding priorities: pediatric research and patient care, maternity and newborn health and family support programs. Riley Children’s Foundation also funds Camp Riley and the James Whitcomb Riley Museum Home and Billie Lou Wood Visitor Center. Don Schumacher Racing, headquartered near Indianapolis in Brownsburg, Ind., fields seven professional NHRA teams in the NHRA Mello Yello Drag Racing Series. In Top Fuel, the U.S. Army dragster driven by eight-time world champion Tony Schumacher, the three-time and reigning NHRA Top Fuel world champion Matco Tools/U.S. Army/Mello Yello dragster driven by Antron Brown and Leah Pritchett in the Papa John’s Pizza dragster. In Funny Car, the Riley Kids 2017 Dodge Charger R/T driven by Tommy Johnson Jr., reigning world champion Ron Capps and NAPA AUTO PARTS Dodge, two-time world champion Matt Hagan in the 80th Anniversary Mopar/Express Lane Dodge and 2012 NHRA world champion Jack Beckman in Doug and Terry Chandler’s Infinite Hero Foundation Dodge. BROWNSBURG, Ind. (Aug. 8, 2017) – The late Terry Chandler’s dream of having a “giving car” in the NHRA Funny Car category will continue through 2020 after her husband, Doug Chandler, agreed to continue her mission and fund two Funny Cars with Don Schumacher Racing. The Dodge Charger R/T Funny Cars will continue to be driven by Tommy Johnson Jr. and Jack Beckman in the NHRA Mello Yello Drag Racing Series and will continue to benefit worthwhile non-profit organizations. Since Terry began funding the teams in 2014, they have donated branding space to the Make-A-Wish and Infinite Hero foundations. She started a tradition in 2013 using Johnson’s team to promote Riley Hospital for Children’s Riley Kids program during the U.S. Nationals over Labor Day Weekend near Indianapolis, and that will continue at this year’s event. Terry was diagnosed with advanced brain cancer early this year and lost her valiant fight against the disease on July 4. She was 65. Terry, who was presented with the NHRA Blaine Johnson Award in 2015 for her dedication to helping others, was a mainstay at the starting line when her Funny Cars raced, and also was there for Pro Stock competition to support her nephew Shane Gray and his son, Tanner Gray. Terry, and now Doug, will use the “giving racecars” as platforms to continue promoting awareness for great causes. “Terry is just an incredible lady, and we’ll never know how many lives she impacted and how many will continued to be helped with Doug continuing what she started,” said Don Schumacher, owner of DSR and close friend of the Chandlers. “We miss her every day, but we’ll never forget her smile and her big heart. “Doug could have walked away from NHRA drag racing and it wouldn’t have done anything to lessen Terry’s legacy. His decision to continue what she started for the next several years shows his love and admiration for what she accomplished.